The App Store has never been a very quiet place. 2010 was no exception; thousands upon thousands of new apps were submitted to the App Store. 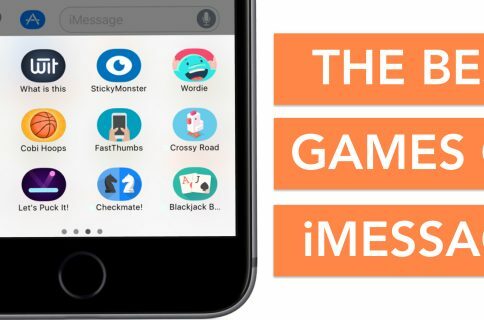 Most of them aren’t worth mentioning, but there have been some exceptional apps that have risen to the forefront of what the App Store has had to offer throughout the year 2010. We’ve covered a lot of App Store apps this year on iDB, with the goal of keeping our readers in the know. Simplenote is what the native Notes app in iOS should have been. It’s almost too clean and minimal for its own good. The app received a major update this year, which gave it great features like cloud-syncing with most platforms (mobile and desktop), more robust sharing and a fullscreen mode for writing longer notes. 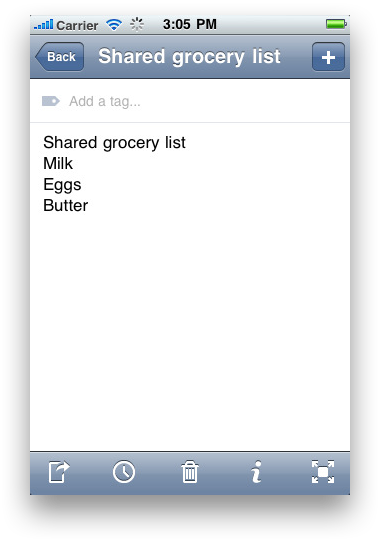 Lots of people use Simplenote exclusively for their note-taking/reminder needs. There is no distraction in the interface, and the feature set of the app is quite impressive. Pick up the ad-supported version for free in the App Store. There is a one time, in-app upgrade available for $4.99 that removes ads. There have been multiple Google Voice apps released this year. Some were pulled, but you could always use the Google web interface in mobile Safari. 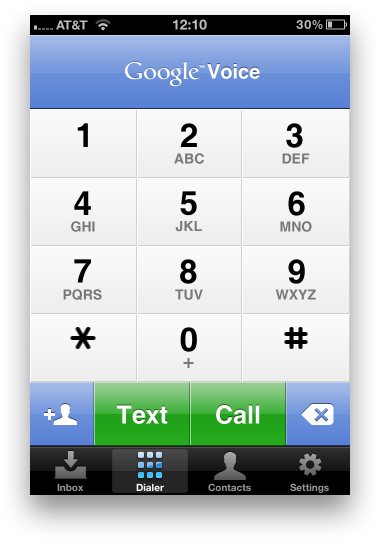 Then, in November, Google released their official Google Voice app. And it’s awesome. If you have a Gmail account, chances are you’ve at least looked at Google Voice. Google Voice is Google’s own, free VoIP (Voice Over IP) service that integrates with your Gmail account. You can use your Google Voice number to transcribe voicemails in text and manage calls with your own, callable Google Voice number. It’s a pretty sweet service. You can pick up the official app for free in the App Store. Dropbox really is the perfect cloud storage solution. Once you start using it, you don’t know how you lived without it. The official iPhone app underwent a major update this year, bringing more features like the exporting of Dropbox files to other iOS apps and upgraded integration with the iPhone’s camera roll. Dropbox has tiered pricing for different amounts of cloud storage capacity, but if all you really need is a cloud-based USB drive for some important files, there is a free 2GB account. The iPhone app is wonderful for viewing and downloading your files/media on the go. 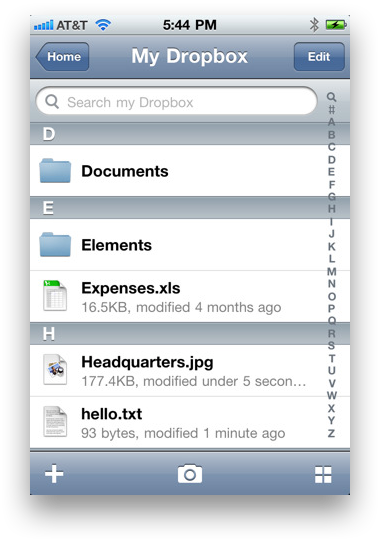 It also works great with other apps like PlainText for editing and creating documents straight on the iPhone. Pick it up for free in the App Store. Remote is one of the surprisingly few, downloadable apps made by Apple in the App Store. 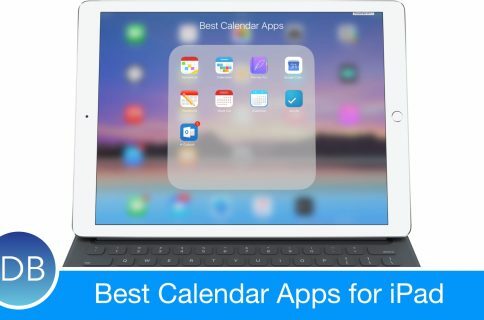 It is a must-have app for anyone who owns more than one Apple product and/or uses iTunes. It lets you control your media from your iPhone in the easiest way that only Apple could have designed. With Remote, you can control and edit your computer’s iTunes library (along with any locally shared libraries on your network), control any AirPlay enabled device and control the Apple TV. 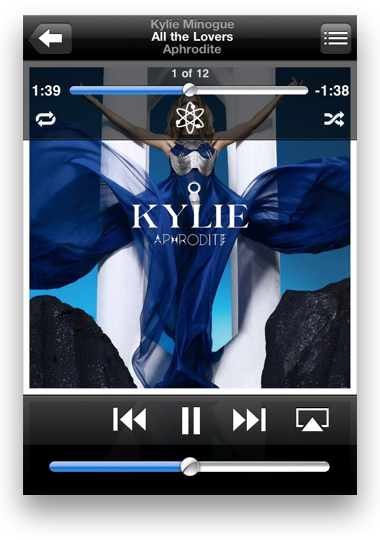 The Remote app is quite robust and incredibly “magical” (as Steve Jobs would like to put it). There’s no reason to not have this app in your iPhone utility arsenal. 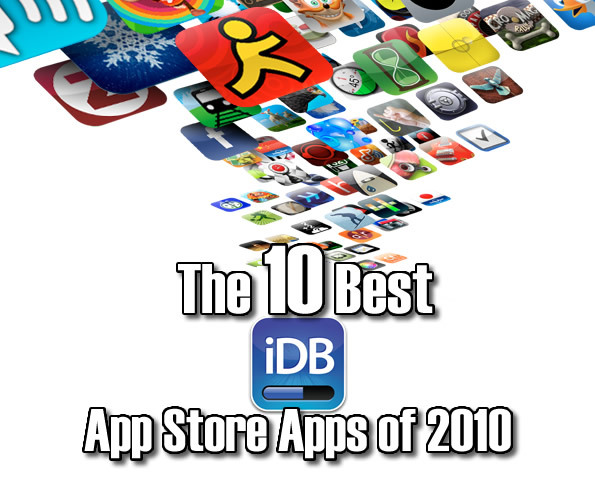 A game is in the top ten list of App Store apps of 2010? Yes it is. Games were a huge part of the App Store this year. Cut the Rope was one of the games that rose to the top of the iTunes charts quickly. We reviewed the game in detail when it came out in October. 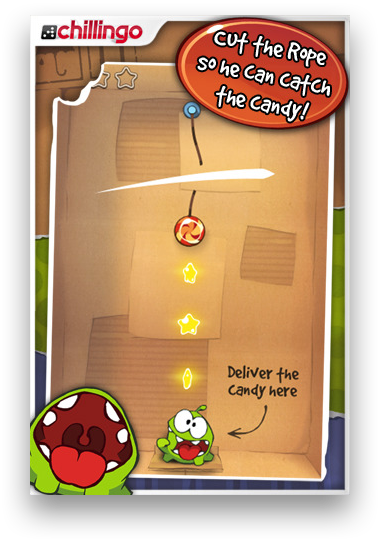 Cut the Rope is an addictive puzzle game in which you try and get a piece of candy into your pet Om Nom’s mouth. You do so by cutting ropes that the candy is attached to with your fingers. The mechanics and physics engine in this game make it quite enjoyable. It is definitely one of the crown jewel games from 2010. Pick it up for $0.99 in the App Store. There is also a free, lite version available if you want to give it a try before buying. Netflix owns the online, streaming media market. Next to Youtube, no one company serves more online content to as many users as Netflix. Towards the beginning of this year, there was speculation that Netflix was going to bring their service to the iPhone. Steve Jobs even talked about Netflix coming to the iPhone at the 2010 WWDC keynote. Many months later, the app finally arrived. It is a must download for any Netflix subscriber. With the Netflix app, you can stream all of your available Netflix content straight on your iPhone and manage your instant queque. Streaming is supported on 3G as well as Wi-Fi, and a recent update allows for video-out to your television. Pick the app up for free in the App Store. You must be a Netflix subscriber to actually access any content. Instagram has been a huge success in the short time that it’s been in the App Store. We reviewed the app when it came out, and it has continued to grow into the most used photography-based social network on the iPhone. After being in the App Store for only a couple of months, the network now boasts over one million active users. Instagram makes photography on the iPhone dead easy. There are no real manual editing capabilities in the app, just a plethora of popular, retro filters. However, Instagram is more than just filters; you create an account with Instagram to share your photos with your friends and view other photos that your friends are taking. 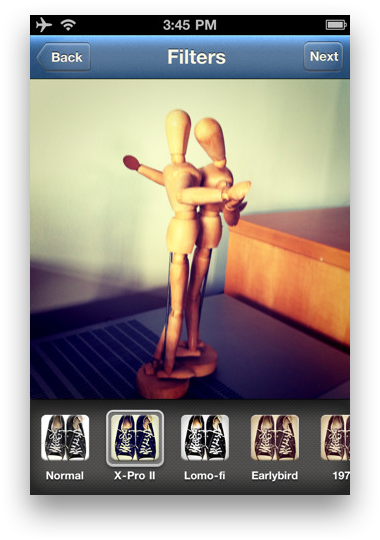 You can also share your filtered creations to other popular social networks, like Twitter and Facebook, within the app. Pick up Instagram for free in the App Store. 2010 was the year that the most popular Twitter client for the iPhone, Tweetie, was acquired by Twitter and rebranded into the official Twitter app for iOS. 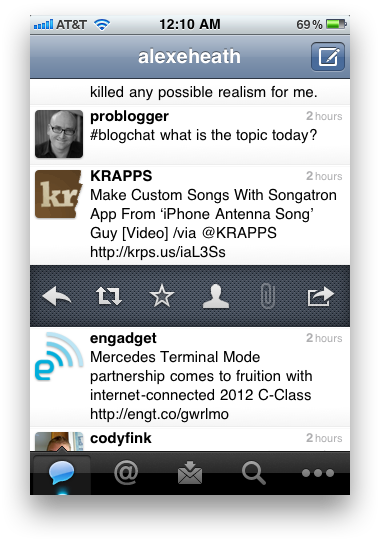 The official Twitter app brought a lot of the native features of Tweetie into its design, and also added a few more. Twitter’s app is fantastic in just about every way possible. The “pull to refresh” feature that was first available in Tweetie 2 makes updating your Twitter feed intuitively fun. There are plenty of other third-party Twitter apps out there to choose from, but the official Twitter app has the cleanest interface combined with the most robust feature set. It was recently updated to support push notifications for “@” replies and DMs as well. Best of all, it’s totally free. Pick it up for $0.00 in the App Store. It may seem a little undeserving to place a Google Reader app at the number two position of this list, but Reeder is no ordinary RSS reader. In the eyes of most, Reeder is the unparalleled king of RSS readers for iOS. Reeder is beautifully designed, lighting fast and feature rich. 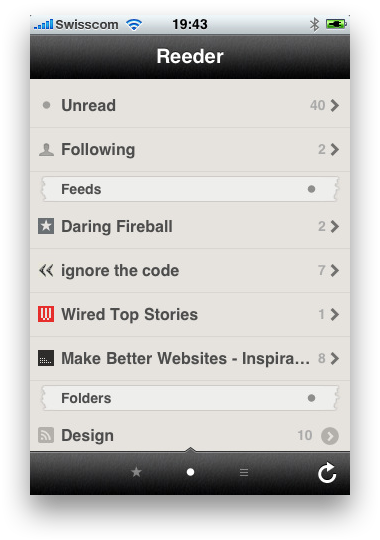 Reading through your RSS feeds is a breeze with Reeder. And Reeder boasts the best sharing options for articles there is. There is support for sharing to all of the popular social networks, including Facebook, and many other options for handling or viewing an article in different ways. If you use, or have used Google Reader for RSS, there is no reason to not have Reeder on your iPhone. Pick up Reeder for $2.99 in the App Store. Who doesn’t know the household name that is Angry Birds. This game has made more money than every other app on this list combined and multiplied by ten. Angry Birds has turned from merely a hugely popular iOS game, to a full-fledged franchise. You can buy Angry Birds plush toys and Angry Birds iPhone cases. There have even been talks of there being a full feature-length film in the works based on the game’s story. Most people who have an iDevice either own or have played Angry Birds. If you haven’t, you’re missing out on one of the best gaming experiences the App Store has to offer. 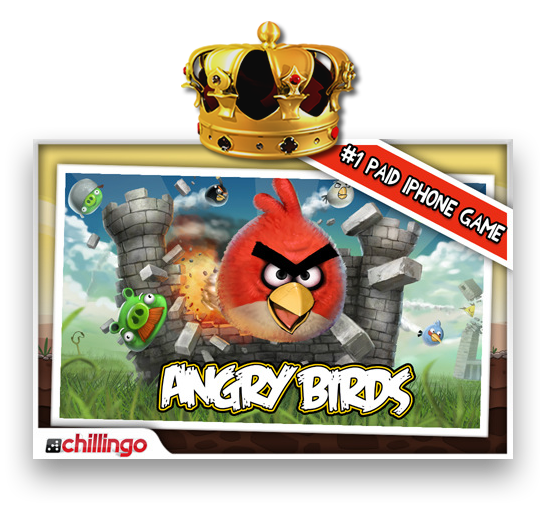 We here at the iPhone Download Blog love Angry Birds, and hopefully you do too. With over 16 million dollars in profit from App Store sales alone, I think it’s safe to say that Angry Birds deserves its spot at number one on this list. It’s definitely the most universally recognized app of 2010. If you haven’t already, pick up Angry Birds for $0.99 in the App Store.